UF VETS offers a variety of training opportunities to better prepare first responders and animal owners for technical rescue emergencies. Our courses follow learning objectives for the 2017 edition of the National Fire Protection Association (NFPA) 1670 Standards for Search and Technical Rescue and the 2017 edition of the NFPA 1006 Job Performance Requirements for Technical Rescue. To schedule a training for your organization, please contact Brandi Phillips – 727-735-5109. This is the foundation course for more advanced levels of our training program and suitable for first responders in fire, EMS, and law enforcement as well as veterinarians, veterinary technicians, and pet, livestock, and exotic animal owners. Participants will get an overview of the need for animal technical rescue, resources to activate, how to assist rescue teams, scene safety in animal emergencies, and common techniques and tools used in operations level responses. This course is available in a live format for 20-45 participants as a one day, 8-hour training. This version is recognized for 8 hours of Continuing Education credit from the Florida State Fire College. You may also complete the online version of the course in a self-paced, open enrollment format. The online version is recognized by the Florida State Fire College for 7 hours of Continuing Education credit. This is a two-day, hands-on, intensive animal technical rescue training course that covers small and large animal rescue equipment, techniques, and scenarios. At the end of the course, participants perform a mock technical rescue scenario using a realistic training mannequin. 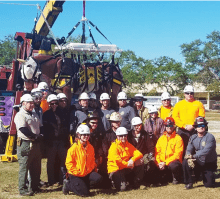 This course aims to prepare local response teams and is used to support animal technical rescue teams in Florida’s seven domestic security task force regions. An optional third day can be added to provide additional scenarios to better prepare responders. Training is delivered at local venues organized by a host agency and occasionally at the Florida State Fire College. This course has been approved by the Florida Department of Emergency Management and FEMA. The Florida State Fire College has also approved the course for 16-24 hours of Continuing Education credits. Classes are capped at 20 participants to ensure safety and an intensive learning environment. This is a two-day, hands-on, intensive animal technical rescue training course that covers advanced small and large animal rescue equipment, techniques, and scenarios. At the end of the course, participants perform a mock technical rescue scenario using a realistic training mannequin. Skills developed in this course include helicopter rescue, advanced sling systems, high angle low-point edge transitions, pick-offs, and highlines. This course has been approved by the Florida Department of Emergency Management. The Florida State Fire College has also approved the course for 16 hours of Continuing Education credits. Classes are capped at 20 participants to ensure safety and an intensive learning environment. Smaller scale clinics can be designed to provide groups with safety practices and basic skill sets when dealing with downed large animals in low-technical situations. 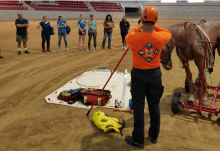 Our team can train skills for performing low-angle assists and relocating a downed animal on a rescue glide for groups that would like to be able to perform basic first response functions (great for farm employees, ranchers, equestrian centers, etc.). 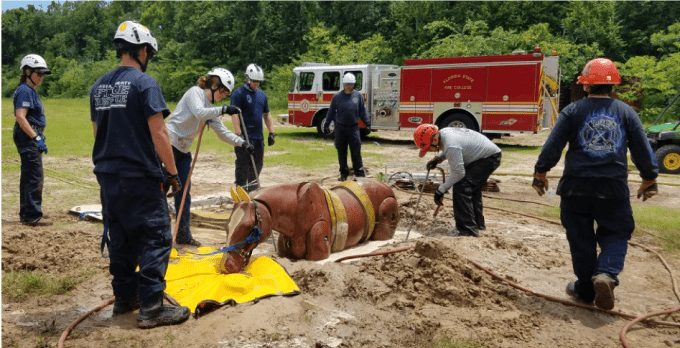 These opportunities do not meet NFPA requirements or result in certification, but can enhance human safety in common, low-tech animal rescue emergency situations. UF VETS provides a scholarship for first responders to attend our open enrollment classes. Enrollment for our operations level open enrollment course is $600 per person. By donating, you are helping ensure that a first responder receives valuable training to better assist animals and people in their community.